Microstructure evolution during steel processing assumes a critical role in tailoring mechanical properties, e.g., the austenite–ferrite transformations are a key metallurgical tool to improve properties of advanced low-carbon steels. Microstructure engineering is a concept that links the processing parameters to the properties by accurately modeling the microstructure evolution. Systematic experimental laboratory studies provide the basis for model development and validation. Laser ultrasonics, dilatometry, and a range of microscopy techniques (including electron backscatter diffraction mapping) are used to characterize recrystallization, grain growth, phase transformations, and precipitation in high-performance steels. Based on these studies, a suite of state variable models is proposed. 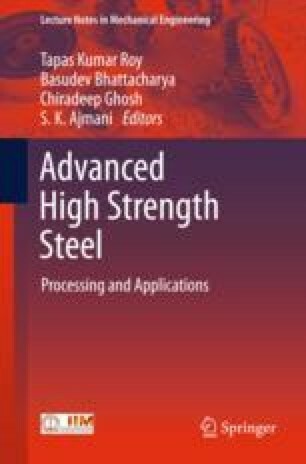 Examples of their applications are given for intercritical annealing of advanced automotive steel sheets and welding of high-strength line pipe grades. The extension of state variable models to the scale of the microstructure is illustrated using the phase field approach. Here, the emphasis is placed on simulating the austenite decomposition into complex ferrite–bainite microstructures. The challenges and opportunities to develop next-generation process models will be discussed.